You may have been thinking about having LASIK surgery for a while now. As the seasons change, is it time to take the leap? Here are a few questions to ask yourself to decide if this spring is the right time to give yourself the gift of better vision. You will need to meet with an laser coordinator to be sure you’re eligible for LASIK. The best results are seen in patients who are at least 21 years old. Your prescription should be stable for a minimum of a year. You need to be in good health. Being able to heal well is important for a good result. Your eye doctor will also ask about your history and your family history of eye disease. If you’re pregnant or nursing, you will need to wait, because of the steroid drops you are on after the surgery. Dr. Grigsby says that it’s a myth that vision changes during or after pregnancy. Your doctor will examine your eyes for things such as pupil size and cornea thickness to find out if you’re a good candidate for LASIK. Can I follow the recovery instructions? At Eye LASIK Midland we recommend 4 days off of work/driving for LASIK. Depth perception is off during that time making driving unsafe. But despite the fact that you will probably have an easy, uncomplicated recovery, there are a few things to be careful about. You’ll have to take a break from certain sports, such as swimming. Your surgeon will let you know what to avoid and for how long. No eye makeup for a week. You’ll probably be able to drive within 4-5 days. You can return to work, but avoid dusty, windy conditions or strenuous activity. It’s important to go to follow up appointments to be sure you’re healing well and to address any issues you may have, such as dry eyes. You’re the only one who can be sure if you’re ready to take the step of LASIK surgery. Here are a few things to consider. If you’re concerned about what LASIK surgery will be like, write down a list of questions for your surgeon, or take a look at these answers to some common worries. Come up with a plan for how you will pay for the surgery. Here are some suggestions to consider. Ask yourself what life will be like with no glasses or contacts. 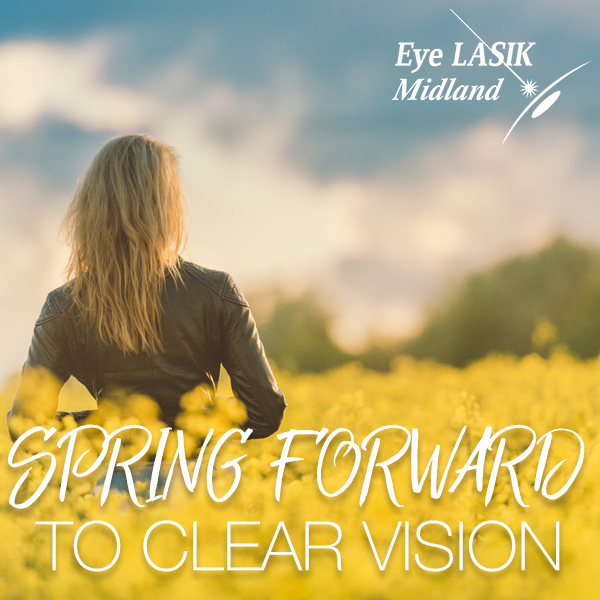 If you’re ready for a new outlook on life this spring, please contact us at Eye LASIK Midland for a free consultation.